Save Clicker is a browser plug-in that is believed to help you save money when shopping online. The application is said to be compatible with Internet Explorer and Mozilla Firefox but it also works on Google Chrome. The browser plug-in is available at saveclickersoft.info, but it may also be bundled with other programs. If you are an active computer user and like to test various computer programs, be cautious when browsing freeware websites. A lot of free computer programs are bundled together in order to be installed on as many computers as possible. By reading the license agreement and the other information provided by the installation wizard, you get a chance to prevent the additional programs. Save Clicker works on various shopping websites, including Best Buy, Cellular OutFitter, and Target. 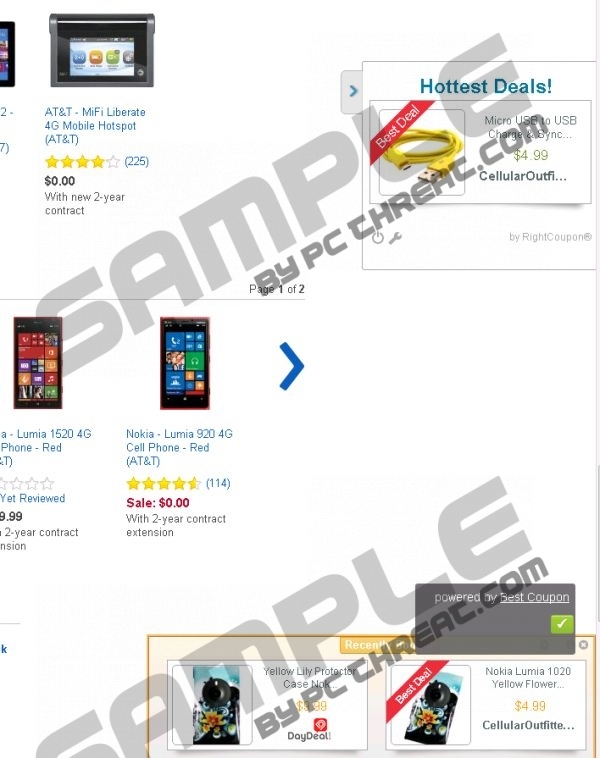 The coupons are displayed on the right side of the website and bear the label “Hottest Deals”. It has also been found that the coupons are related to RightCoupon. Moreover, on some of the shopping websites, a Jollywallet bar offering to get a particular percentage of the amount spent on the partner’s website may appear. If you have already tried Save Clicker, you may have noticed that it can take you to third party websites. Bear in mind that those websites are not owned or controlled by Save Clicker, which means that your interaction with the service is your own responsibility. Save Clicker does not take responsibility for the consequences that follow your interaction with the websites, and any data loss or damage caused to the computer due to your interaction with third parties is not related to Save Clicker. The fact that Save Clicker provides you with a coupon does not mean that its content is reliable. Hence, if you do not want to risk your privacy, remove Save Clicker from the browsers. If you are determined to remove Save Clicker from the computer, we recommend that you implement a spyware removal tool because automatic removal is easily the best way to get rid of the unwanted application. Use SpyHunter if you want to have the system thoroughly scanned and harmful files removed. This anti-spyware program can easily eliminate Save Clicker and protect the system against various computer threats. Right-click when the pop-up window appears. As soon as you finish the removal, install a reliable scanner in order to make sure that all the components of the unwanted program are removed from the system. Quick & tested solution for Save Clicker removal.